The Chain Pier, Brighton in the 1890s. 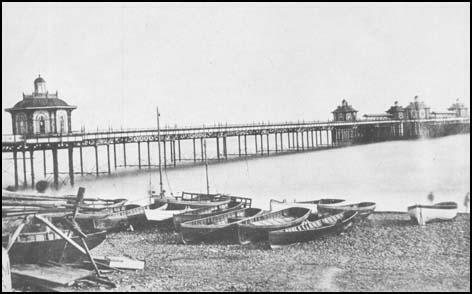 As early as 1824, the Chairman of the Brighthelmstone Suspension Pier Company had announced that thousands of visitors had come to Brighton to see the Chain Pier, "a structure that has been the subject of conversation throughout the Kingdom." 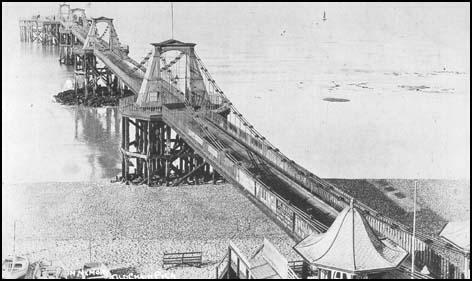 A number of amusements were based on the Chain Pier to entertain and serve the visitors who promenaded along the pier's 350 yard long platform. A silhouette artist operated in a kiosk under the third tower and "with scissors only" made full length portraits of visitors. The silhouette artist Edward Haines worked on the Chain Pier between 1830 and 1860 and charged !s 6d for a head and shoulders portrait and 2s 6d for a full length silhouette. In October 1853, the proprietor of the Royal Chain Pier Photographic Rooms was offering "portraits superior to engravings by the new process on glass, complete in case or frame" for the price of 5 shillings. A painting dated 1861 showing the old entrance and the esplanade leading to the Chain Pier.The little group of houses against the sea wall, sitting directly opposite the Chain Pier, housed a number of photographic studios over the years. The Chain Pier and its esplanade became crowded with visitors and so was an ideal location for a portrait photographer. In 1858, Charles Combes, who had previously ran a daguerreotype portrait studio with his brother John Combes at 62, St James Street, took photographic portraits on the esplanade of the Royal Chain Pier. G.A.Lloyd was running a photographic booth at 3a Chain Pier in the late 1860s and photographic portraits were taken on the same site by a Mr.Weller from 1870 to 1875. In 1881, the photographer at 3 Chain Pier was a Mr.G.H.Hemmings. The Chain Pier, Brighton, seen from the pier head. (c1870).The towers supporting the chains housed small shops, selling sweets and souvenirs. The towers also provided little studios for silhouette artists and portrait photographers. The Chain Pier had its entrance at a toll house near the bottom of the Old Steine and was reached by means of an esplanade which ran along the top of the beach. 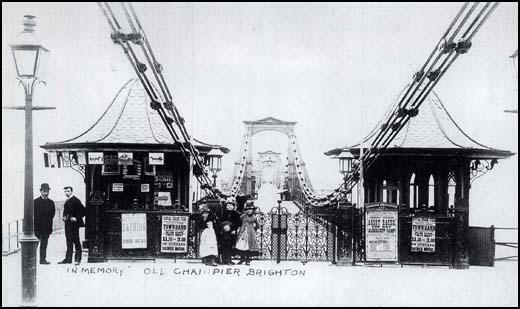 The Chain Pier Toll House and Esplanade were demolished to provide the site of Brighton's Aquarium, which opened in August 1872. Two new toll houses were erected at the foot of the Chain Pier. A new esplanade was built on a recently constructed sea wall and was given the name Madeira Road. In January 1881, the photographer Alfred Sharp was running the Chain Pier Studio at 2 Madeira Road. Mr Sharp passed on the Chain Pier studio to a Mr Goddard in 1883. George Owen Goddard was a cycle maker and operated a bicycle depot next door at No 3 Madeira Road. The firm of Thompson & Gordon also ran a bicycle depot on Madeira Road and in trade directories for 1886 and 1887, they too are listed as photographers at 2 Madeira Road. The Madeira Road studio carried the name of Combs until 1900, but for a couple of years around 1890s, a competitor was working as a photographer from the same address. Page's 1890 Directory lists B. Combs, photographer, at 2 Madeira Road, but under Photographic Artists in the Trade Directory, W.H.Gardner is also listed as a photographer at 2 Madeira Road. Both photographers are listed at 2 Madeira Road in the 1891 Directory. 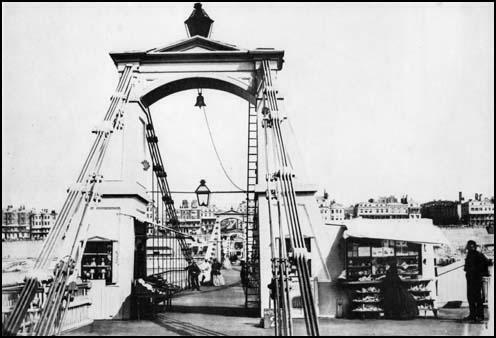 The Entrance to the Chain Pier, Brighton (c1895).Alfred Sharp's photo booth can be seen housed in the toll house on the left. Alfred Sharp, the original proprietor of the Madeira Road studio, worked as a beach photographer for about 5 years, but from around 1889 he based himself at the East Toll House at the entrance of the Chain Pier. Alfred Sharp was the Chain Pier's resident photographer almost to the end of its existence. In 1896, the Chain Pier's structure was declared unsafe. 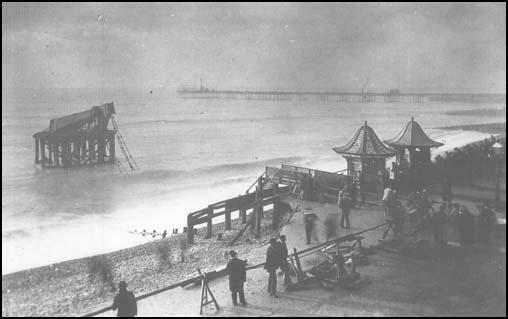 On the evening of 4th December 1896, the Chain Pier was completely destroyed in a violent storm. The Chain Pier was destroyed by a fierce storm on the evening of 4th December 1896.This photograph, credited to Thomas Donovan, shows all that was left of the Chain Pier after the gale force winds had done their damage. Around 1900, to commemorate the lost pier, William Leal opened the Chain Pier Restaurant at 2 Madeira Road, and for a few years he continued to take photographic portraits in the Madeira Road studio. By 1905, the studio at No 2 Madeira Road was in the hands of Walter M Carrington who carried on at this address until the First World War. 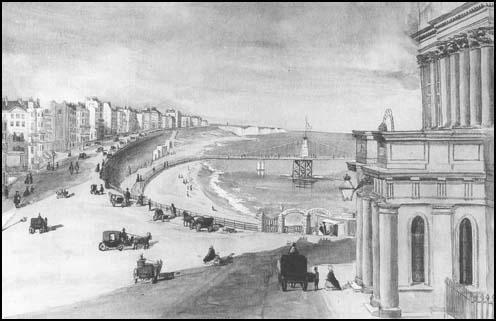 The West Pier was constructed opposite Regency Square on the western seafront, between 1863 and 1866. The West Pier was opened to the public on 6th October 1866, but no photographer is listed with a West Pier address until four years later. The 1870 Post Office Directory fo Sussex records William Hall as a photographic artist at 21, North Street and 8, West Pier. Hall's West Pier studio was taken over by Henry Parnell around 1873, but his tenure was brief. Robert J. Parnell, probably a relative of Henry Parnell, also took photographs at a West Pier address around 1873. Visitors to the West Pier listen to a band on the open deck of the pier-head.This photograph was taken around 1870, when William Hall established a photographic gallery on the West Pier. The West Pier in the early 1880s. The steps on the right led down to the beach and the Lower Esplanade, where William Dawson operated a photographic studio for over thirty years. William Dawson plied his trade at a spot close to the West PIer entrance from 1878. Giving his studio address as The Beach until the early 1880s, Dawson worked as a photographer on the seafront beyond 1910. He occupied one of the arches under the Kings Road, very near the West Pier, but he also owned a more orthodox photographic studio at 128 Richmond Road. In the 1891 Census, William Dawson gives his occupation as "Mineral Water maker, tobacconist and photographer." In the 1890s, Dawson ran a refreshment bar and photographic rooms at 68 Kings Road Arches. By 1908, William Dawson was working as a photographer at 65 Kings Road Arches and also ran a kiosk on the West Pier. William H Schwartz, a French born, German photographer, is first mentioned as a photographer on the West PIer in a directory of 1895. Schwartz continued taking photographs on the West PIer until 1913, on the eve of the First World War, a time when his nationality may have proved to be unpopular. 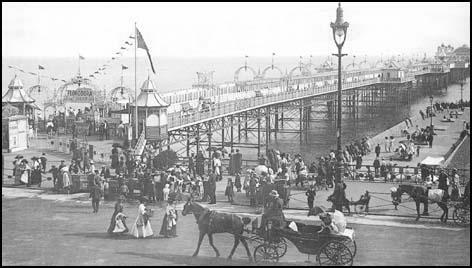 The Palace Pier, Brighton around 1910. 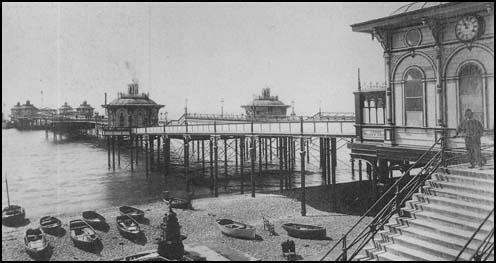 The Palace Pier was designed to take the place of the old Chain Pier on Brighton's eastern seafront. 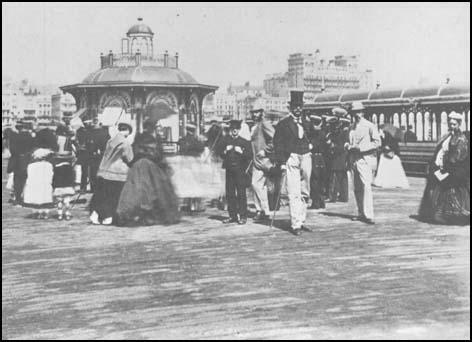 Situated opposite the Old Steine, the Palace Pier opened to the public on 20th May 1899. By this date, holidaymakers requiring photographic mementos of their day at the seaside were well catered for by the numerous beach photographers, the studios on Madeira Road and the half dozen photo studios located in the Kings Road Arches on the seafront . John James Avery, a London photographer, established a studio with the address The Pier, Madeira Road around 1909, but by the following year he had abandoned his pier studio and established J.J.Avery's tea rooms at 181 Kings Road Arches. In the early 1900s, the American Art Rapid Photography Company ran a photo booth on Brighton's Palace Pier , where holidaymakers could turn their photographic portrait into a picture postcard. ( See fig. 5 in Section G : Picture Postcards ).